Julia Matlash remembers the night four years ago that turned her world “upside down”: her parents called from the family home in Russia. Julia’s 96-year-old grandmother had died from a bacterial infection that could have been easily treated if she’d gone to a doctor. “It turned out that my parents knew that she was sick but refused to give her antibiotics, believing that the infection could be cured by homemade remedies, like herbal teas,” she said. At that moment, Matlash decided to change her UCF major from digital media to biomedical sciences so she could learn more about medical treatment, become a physician and help those like her family members who distrust doctors. On Saturday, Matlash will be one of 101 students graduating from the College of Medicine’s Burnett School of Biomedical Sciences. UCF will hold two commencement ceremonies August 4. UCF President Dale Whittaker will confer more than 3,700 degrees during his first graduation exercise as the university’s chief executive. 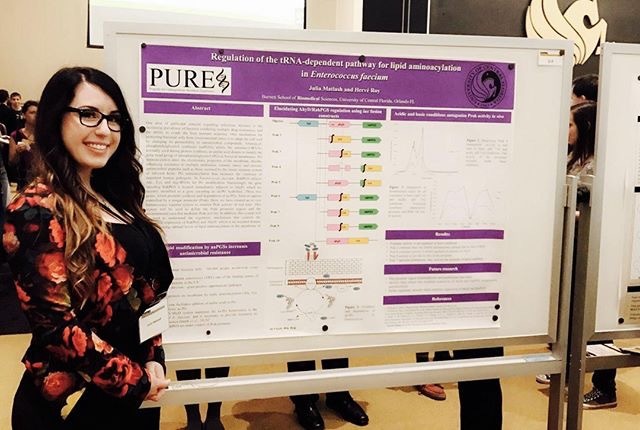 As a UCF biomedical sciences major, Matlash served as a human anatomy teaching assistant and transfer orientation peer advisor, volunteered at Orlando Health and studied proteins involved in antimicrobial resistance in Dr. Herve Roy’s laboratory. Many in-hospital deaths occur because patients get infections that are resistant to antibiotics. “Learning more about the proteins can lead to a discovery of novel antimicrobial compounds and reduce the death rates from antibiotic-resistant bacteria worldwide,” she said. After graduation, Matlash plans to take some time off to prepare for the MCAT medical school admission exam and then apply to medical school. She’ll also be visiting her family back home in her hometown of Pyatigorsk in the Caucasus Mountains. She’s the only one in her family who has left Russia. “It has been several years since I saw my parents, and it is definitely not easy,” she said of getting her bachelor’s degree thousands of miles from home.